That Martian space-robot has gone for another space-drive - having poked and sniffed and ingested lots of Martian space-dust over the past weeks. Did it detect something important? We don't know yet! 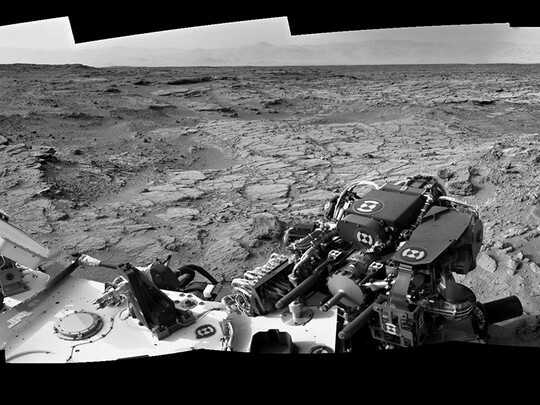 Interactive MSL Curiosity NAVCAM panorama - for sols 102 through to 104. I hear they're going to be taking shots for a big, full-colour panorama over Thanksgiving. Whatever that might be. Anyway, to celebrate I've been poking away at Hugin and Photoshop to produce another Pannellum-powered interactive panorama. Explore! Requires a WebGL-enabled browser, etc. etc. - works fine for me in Safari and Chrome.